Here is the latest update of the E Ratings and how they predict the rest of the season will pan out. The rating system is explained here, but in a nutshell it’s based on the combined quality of chances that clubs create and allow, rather than their results. After their recent blip, Wigan are again going from strength to strength, while Blackburn and Rotherham have suffered performance dips of their own. The departure of Graham Alexander from Scunthorpe isn’t all that surprising as they’ve struggled to compete with the promotion-chasing pack, particularly in defence where they’ve looked a bit suspect. The change in manager has certainly done Fleetwood no harm – they’ve been rebounding nicely – but there’s not been the same effect at Bradford just yet: the Bantams are continuing to plummet. Northampton now stand out as the team the model hates the most – it ranks them as the worst side at both ends of the pitch. 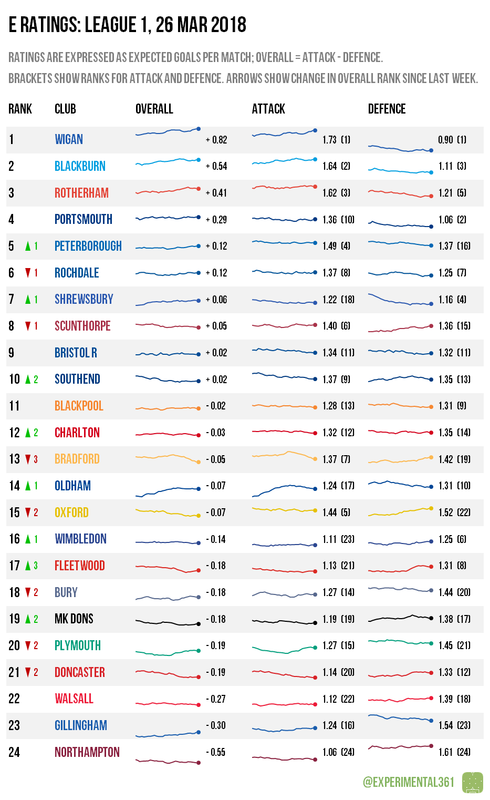 Shrewsbury may still be top, but the model still expects Wigan and Blackburn to make their games in hand – and more dominant performances count. I’d love to see the Shrews go up after their impressive turnaround since Paul Hurst took charge, but (as the first chart shows) their attack doesn’t look nearly as impressive as their defence in the data, so they may struggle to grind out enough wins. Below them the lower reaches of the play-off race remain wide open. Bury‘s latest defeat has their row almost entirely shaded red now: there’s a 10-point gap to Oldham in 20th and the Latics have two games in hand to boot. 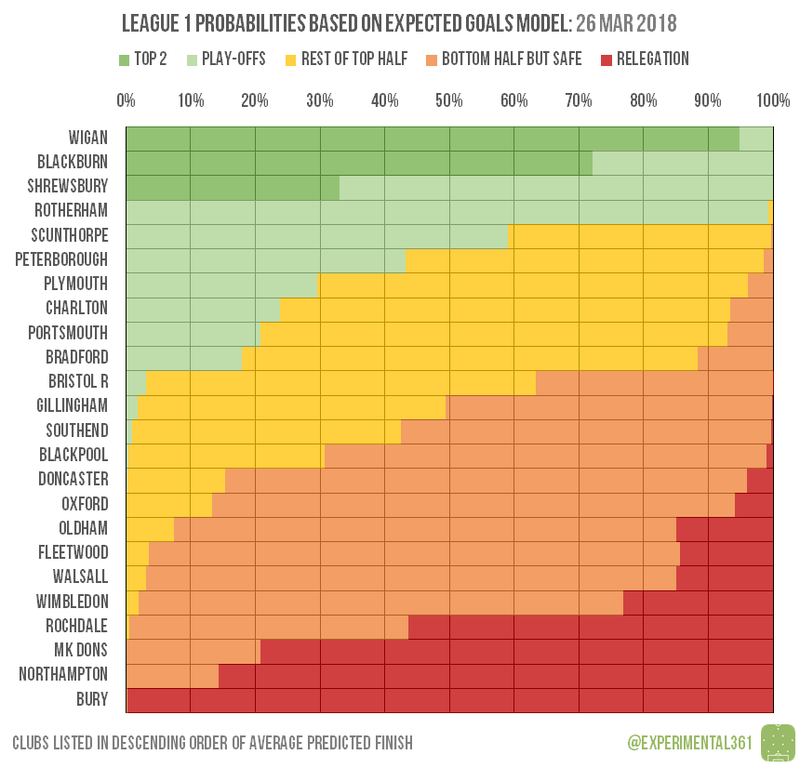 Northampton‘s loss at resurgent Fleetwood – coupled with their own lousy ratings – make them also highly likely to drop into League 2, while Rochdale‘s winless run is keeping them in trouble: they have 10 games in which to close a five-point gap.